It's the kind of twirl a model would be proud of: the retailer has posted results showing a 1.9% rise in sales. 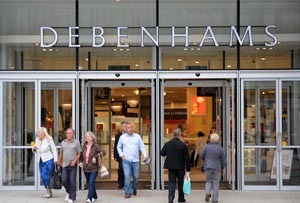 After today’s news that lower-than-usual growth in clothes prices was one of the main causes of a drop in the Consumer Prices Index comes positive news from one retailer: Debenhams says like-for-like sales increased by 1.9% in the three months to the end of August, rising 2% over the full year. So things aren’t all bad on the high street. As with many retailers, online was a big growth area, with sales rocketing by 46.2%. It’s a pretty impressive result considering that in April, the retailer posted a 5.4% fall in profits to £120.3m. At the time, it blamed the drop on bad weather (ie people shivering around their fires rather than braving the arctic March weather to go shopping). So it looks like the warm summer we’ve had was just what the doctor ordered. Michael Sharp, the company’s chief executive, was predictably pleased with its performance. ‘Looking forward, we are confident in our strategy,’ he said. But, as with other retailers, Sharp said he was cautious about calling a total recovery.